Alright adventurers, the New Year has begun and the big question is how are you going to make 2015 a one to remember? Whether it’s visiting an exciting destination, taking yourself to new heights, or just reaching a long term fitness goal, BAI is here to help you achieve your dreams! Check out this list of exciting adventures coming your way! Are you travelling in a big group or looking for a unique family adventure? Or are you looking to join a group of fellow adventure lovers to enjoy a great travel experience with? We have a few trips coming up this year perfect for travellers of all types. Check it out to see which is perfect for you! A classic Berg Adventures trip, a trek to Everest Base Camp takes you to the beautiful Khumbu region. Trekking to and staying in different villages is a great way for groups to immerse themselves in the fascinating Sherpa culture. The hiking is great for people of all ages and can be customized for those concerned about their hiking abilities. Contact us to inquire about our spring and fall treks! Looking to join in the fun spirit and great team camaraderie that Berg Adventures Kilimanjaro trips are known for? We have trips running in Tanzania almost all year round and can accommodate people of all different hiking levels. To add to an incredible African experience climbers can continue on for an exciting wildlife safari in Northern Tanzania. Every year Wally Berg and the BAI Russian guides and staff return to the Caucasus to climb to the highest point in Europe, Mount Elbrus. This is a journey that begins touring two iconic cities; St. Petersburg and Moscow and includes incredible climbing opportunities for those looking for an introduction to high altitude. Join us July 26 – June 12 for a true city to summit experience. From ancient cities to snow-capped mountains our trip to Turkey offers an exceptional travel experience that will open your eyes to a whole new world. Roaming the historic streets if Istanbul, visiting the underground cities in Cappadocia, balloon rides over picture perfect sceneries and a summit of Turkey’s highest point, this trip really does it all! Have you been looking to work on your mountaineering skills? Berg Adventures guides and staff (http://www.bergadventures.com/v3_main/guides.php) are always excited to help climbers gain the skills and confidence needed for climbing in altitude. The following trips are perfect for those looking to learn more about technical climbing. It may only be a few weeks away but there is still time to sign up for our 2015 Ojos del Salado expedition from February 15 – March 2() . Standing at 22,615ft/6,893m this climb is a way to learn the importance of acclimatization and preparing for high altitude mountain travel. Join us next month and stand on top of the world’s tallest volcano. Colorful culture, breathtaking scenery and awesome climbing opportunities are just a few of the factors bringing Berg Adventures back to Bolivia every year. We offer a few different programs designed for beginner climbers or those looking to add some technical climbing to their list. 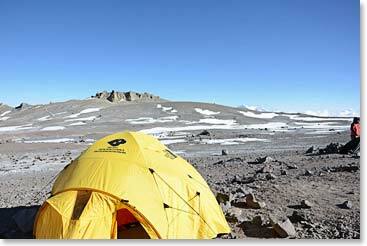 There are a few spots left on our Sajama and Condoriri expedition this year from June 05-June 21. Contact our office for details! 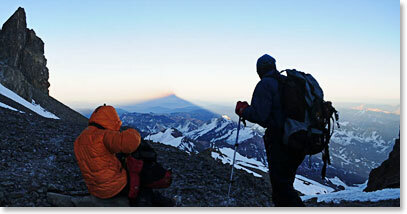 Personal trainer Terri Truman has been offering us amazing information on how to train for mountain travel. Now Terri is set to embark on her own BAI adventure. She and her husband Tim will be travelling to Ecuador to climb four impressive volcanic peaks. She will be explaining her training process for climbers interested in a great fitness regime which you can read here. Join Terri and Tim from November 21 – December 5. In November of last year we had a team of three successful climbers reach the summit of Island Peak. Climbing in Nepal is always a rewarding experience and practicing your glacier travel techniques while standing under the great Himalayan giants is the ultimate adventure! Berg Adventures knows high altitude. We are here to take you to places not many people can say they have been. Whether it is an exotic and remote destination or a trip that has you standing on the high reaches of earth, we are here to take you there. If remote trekking, exotic cultures and technical climbing are what you are looking for then a trip to the remote jungles of Western Papua is perfect for you. A climb of Carstensz Pyramid is one unlike any out there. Contact our office about dates and prices! This classic Himalayan climb is technically challenging and thrilling at the same time. Berg Adventures guides will lead the route and fix it where necessary. Our climbing team will ascend one of the regions 6000m peaks in preparation for this impressive ascent. Join us in Nepal from October 17 – November 21 when we attempt the lofty summit of Ama Dablam. Our first climb of 2015 was of Aconcagua. It was a fantastic way to start of the New Year as our Friends from Vancouver did it right with two team members standing on the summit and the rest reaching personal high altitude records. It is not too early to start planning for a summit of the highest point in the Western Hemisphere. Whatever your goals are BAI is ready to be a part of your next great adventure. Don’t miss out on the chance to turn your dreams into reality this 2015! In just a few weeks Trevor Stuart, long-time Berg Adventures climber and philanthropist will be taking on an impressive challenge: climbing Aconcagua in support of YWCA Lethbridge District. Trevor’s campaign “Elevating lives, one peak at a time” is his effort to raise at least $250,000 for YWCA Harbour House and to raise awareness about family violence issues. 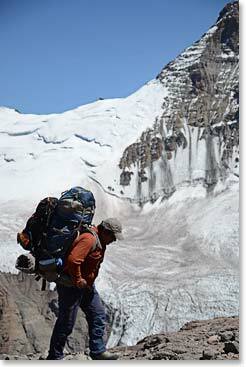 Trevor’s first climb of this campaign will be on the BAI Aconcagua expedition from January 22 – February 11. A climb to 22,841ft/6,962m will be a great challenge for this inspirational fundraiser. Trevor has always been passionate about supporting those affected by domestic violence. “As a child growing up I didn’t know these resources were available. There is a bigger need to help families like I was raised in. There are more and more women and children coming to the YWCA every year, fleeing domestic violence. They need more funding to accommodate that”. After his attempt on Aconcagua this next month Trevor will return to South America with BAI in June, to Bolivia to climb four impressive peaks. But his ultimate goal, which he has begun planning with BAI, Mount Everest in March 2016. Donations can be made through the YWCA Lethbridge District website at: www.ywcalethbridge.org. The link will be under the tab called EVENTS on the website. Please take the time to read more about Trevor’s ‘Y’ and listen to his short YouTube video as well! You will get a great feel for who and what Trevor is all about. To follow along as Trevor attempts these lofty summits check out Berg Adventures dispatch page for news and photos of his progress. 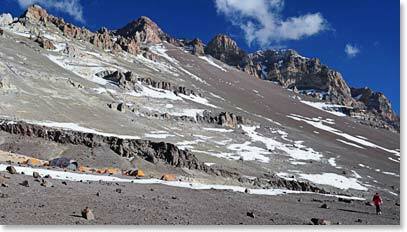 Our 2014 Aconcagua expedition has come to an end. Our team of international climbers from Switzerland, Australia, New Zealand, Brazil, Canada, United States and Bolivia all travelled to Argentina with one goal in mind – to reach the top of the Western Hemisphere. The team faced many challenges from hectic travel conditions on their way over to the wild weather Aconcagua is known for. Our summit team braved heavy winds, polar like conditions at high camp and even got stuck in a snow-storm on their descent from the summit. But with the proper gear, great training and outstanding determination this group challenged themselves and stood on the summit of Aconcagua – 22,841ft (6,962m). Great job team! Contact us today about climbing to the highest point in the Western Hemisphere on our next Aconcagua Expedition. Aconcagua climber Rafael Etges captured footage of the climb on his Go Pro. Enjoy his awesome video! The adventure begins! After many complications due to delayed flights and hectic weather Jean-Pierre arrives – still with a smile on his face and bags in hand! There’s no better way to relax before a big climb then lounging poolside at the Park Hyatt and sampling some of Mendoza’s sparkling wine. The team is together at last and enjoying lunch at one of our favorite argentine restaurants . Osvaldo, Maria, Sergio and Alex making sure we have all the right items to fuel our team for a successful climb. An excited team of Aconcagua climbers! Longtime Berg Adventure climbers and good friends Doc Martin from North Carolina and Dennis Comfort from Seattle travelled to Argentina together to stand side by side on this great mountain. Plaza de Mulas is a great place to spend our first few nights. Climbers can enjoy many things at Base Camp and one of our favorites is the local Argentine wine! We even have movie night at Plaza de Mulas! No matter what challenges she faces Margaret always has a big smile on her face! Enjoying pancakes and Canadian maple syrup at 4,910m(16,108ft)! Arriving back at camp Cananda after a long day of hiking to our cozy North Face Tents and hot tea! Wally calls into the Berg Adventures office in Alberta Canada to give updates on how the team is doing. Life at camp isn’t always what it seems to be! But we enjoy it anyways! Arriving at Nido de Condors to find Maria had hot soup waiting to warm us up! Waking up to polar-like conditions on Aconcagua. Wind and snow make for very challenging climbing conditions. The team takes on very challenging weather to attempt the ultimate goal – reaching the top of the Western Hemisphere. Our Aconcagua Summit Team knows the importance of proper layers. Marie-Jose, Rafael, Simon and Margaret along with their guides had very tough conditions during summit day and the proper gear was essential for their success! We are constantly reminded how great this mountain truly is! Until next year Aconcagua! 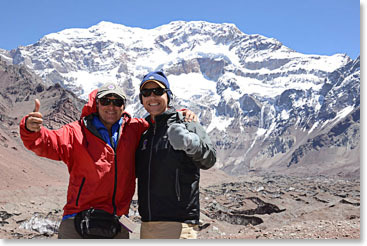 Every January, we start our new year with a climb of South America’s highest peak, Aconcagua. Standing at a jaw-dropping 22,841ft/6,961m, Aconcagua is a true mountaineering challenge that requires strength, endurance and careful acclimatization. The climb is beautiful and full of excitement – a perfect adventure! The sheer magnitude of Aconcagua makes it a great destination for anyone looking to gain expedition experience and also exposure to a high altitude climb. Those with their eyes set on Himalayan climbs will find our Aconcagua expedition to be a valuable part of their training and preparation. At Berg Adventures we always offer the highest standards in the industry. Our Aconcagua expedition is certainly no exception to this rule. Camps are comfortable and stocked with the highest quality of gear and supplies. Our guides and porters will carry all group gear, but if you also want someone to carry your personal gear, private porters are available. We do not hire porters when we arrive in Argentina, instead as bring in our experienced and professional Bolivian team of guides and porters so make sure you let us know in advance! Osvaldo carries a big load. Food on the mountain is exceptional and we pride ourselves on offering a wide variety of fresh foods. Favorites on Aconcagua include Taco Night, pancakes (with real maple syrup!) and hamburgers (no easy feat for our cooks at above 18,000ft/5480m). Hydration is important at altitude, so make sure that clean water is readily available to climbers and we serve plenty of hot drinks throughout the day to keep you moving and feeling good. Aconcagua is different every season and weather is always an important factor that we consider for our summit attempt. We get detailed forecasts every day and try to time our summit attempts just right. At the end of the day, however, the mountain always has the final say so patience is important. That’s what makes Aconcagua so exciting and humbling. Join us in January to see for yourself! 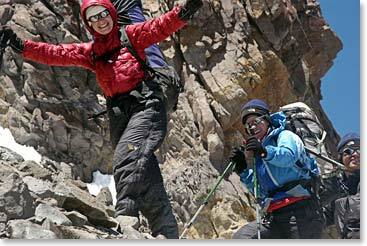 To learn more about the climb, visit our Aconcagua homepage or contact our office. To hear about last year’s climb check out the archived dispatches and read Howard Stockburger’s trip summary on the Meet a BAI Climber page. 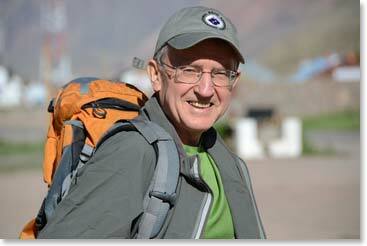 We’d like to introduce Howard Stockburger, a Berg Adventures climber and member of our 2012 Aconcagua Expedition. He sent us a great recount of this year’s climb that we are happy to share with you. Read Howard’s article and visit other BAI climbers on the Meet a BAI Climber page. To plan your own Aconcagua adventure, visit the Aconcagua homepage or contact our office to get the latest Aconcagua brochure. Anyone with any interest in mountaineering today has heard of the infamous Seven Summits – the highest point on each of the seven continents. But just 30 years ago, no one had ever heard of such a concept and only a few had even thought about it. No one had achieved the feat. To learn more about the seven summit climbs, I read two books this month. 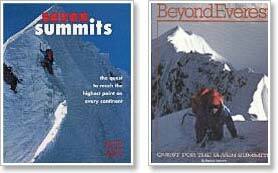 The first is Beyond Everest: Quest for the Seven Summits written by Pat Morrow and published in 1986. The second was Seven Summits: The Quest to Reach the Highest Point on Every Continent edited by Steve Bell and published in 2000. Both books were fascinating and helped me to understand just how difficult these climbs can be. To read the full book review click here. What Are You Doing in January? We’ll Be Climbing Aconcagua. Sitting down and enjoying a delicious meal while watching a roseate sunset at Aconcagua’s Berlin High Camp after a challenging day of climbing—It may not be for everyone, but for those who cherish the outdoors and love the rush of exercise-induced endorphins surging through their tired muscles, it is heaven. Aconcagua is known for being temperamental, but with a little patience, a little perseverance and a little luck, it is an incredibly exciting adventure! Along the summit ridge the views are priceless. 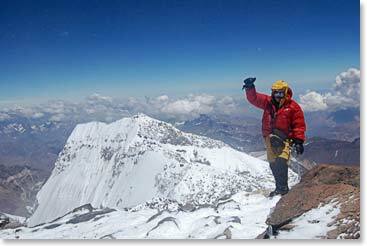 As one of the 7 summits, Aconcagua is the highest in South America. In fact, it is the highest mountain in both the Southern and Western hemispheres. Standing at a breathtaking 22,841ft/6,962m, the glaciated peak of Aconcagua is a physical and mental challenge well-worth the effort. Trip highlights include hiking along the crest of the Andes as we acclimatize in Penitentes, basking in the sun with a cerveza at Plaza de Mulas Base Camp, slowly climbing over two weeks to the summit of South America, sharing stories with climbers from around the world and relaxing in Argentina’s wine country post-climb. 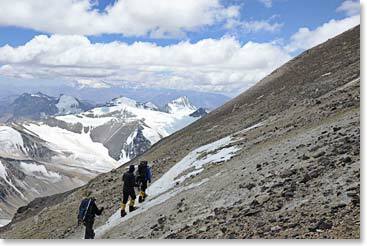 This expedition is an invaluable preparation climb for those with Everest aspirations. Climbing the mountain and loving it! 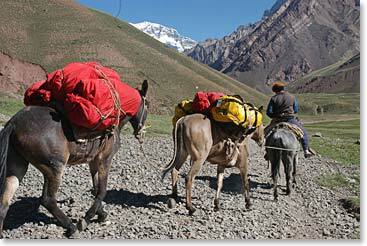 Our trusty mules carry our bags to base camp. While sipping wine in Mendoza is a great contrast to the dusty days of climbing, Berg Adventures strives to offer maximum comfort and “luxury” on the mountain. Our fantastic cook creates delicious meals ranging from Argentine dishes to North American comfort foods using fresh ingredients. Don’t be surprised if you find yourself eating crispy tacos or creamy cheesecake high on the mountain. The attentive and skilled guides, will encourage you, inspire you and keep you safe. Join us on the mountain this January 14-February 3, 2012. Contact our office today! Email: sara@bergadventures.com, phone: 403-609-4148. 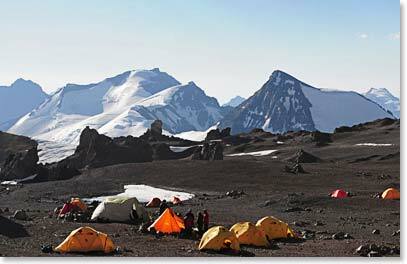 For more information visit the Aconcagua homepage. At 22,841 feet above sea level, Aconcagua is the highest peak in the world, outside of Asia. Join our team this January as we attempt to climb one of the “Seven Summits”. 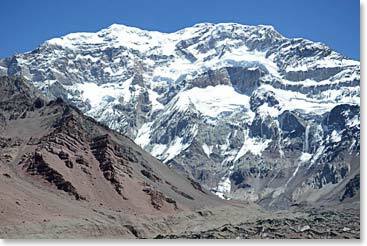 Aconcagua is not only very high but also massive and its profile dominates everything in the region. While enjoying the rich culture of Argentina, our climbers will prepare for one of the most beautiful and rewarding expedition climbs in the world. 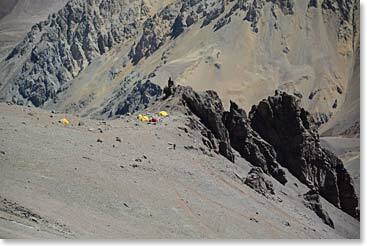 ACONCAGUA JANUARY 08-28, 2011 — Spots still available. 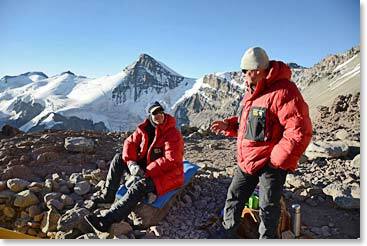 Read more about our Aconcagua trip and view our previous Aconcagua expedition dispatches. Join Berg Adventures International for a magnificent journey to the lofty summit of Aconcagua (one of the Seven Summits), the rooftop of the Western Hemisphere. The highest peak in the world outside the mountains of Asia, Aconcagua is just 80 miles (128 Kilometres) from the Pacific Ocean, yet it rises 22,841feet (6961 meters) into the sky, a massive, dominating presence towering high over Argentina and all of South America.